Fascinating news! Noted with thanks. Interesting article, but not surprising, Environment & nutrition have always played a role in human evolution. The fact that each generation we notice the average height increase in both sexs. very interesting report thanks ! More proof of evolution. Science rocks, as it always has. Evolution moving us forward to androgynous humans. 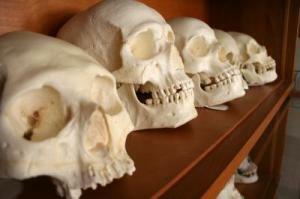 I believe I have a logical theory about why female skulls of the 1600s were smaller. With shorter lifespans and brief childhoods, girls were married frequently at the age of 12. Babies would have followed their first menses, most commonly at the age of 14. The body is still growing in the early teens, and a pregnancy will steal nutrients needed for that growth. Plus the stresses of pregnancy alone can stunt growth, and breastfeeding will deprive the bones of calcium in a diet far more restricted than today�s. Thanks, Angle - I really like this sort of news! Interesting!!!! I have actually noticed that women are much much taller than they used to be and seem to be catching up to men.